Wednesday, an American military tribunal at Guantanamo Bay, Cuba found Salim Hamdan, a Yemini and Osama bin Laden‘s former driver guilty of supporting terrorism. Today, the jury handed down a sentence of 66 months, with credit for time already served. This means that Hamdan could be released in five months. Prosecutors had sought a thirty-year sentence. After hearing the sentence Hamdan said to the jurors, “I would like to apologise one more time to all the members and I would like to thank you for what you have done for me.” He smiled and thanked those in the courtroom as he left. 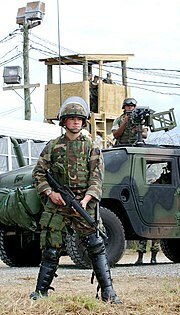 The ten-day trial was the first to test the Bush Administration‘s military-tribunal system for people suspected of terrorism. The trial allowed evidence which would not be allowed in either a civilian or a military court, including hearsay as evidence for the conviction of Hamdan. The original charges to Hamdan included five counts of supporting terrorism, but the judge, Navy Capt. Keith Allred, ordered only one count factor into the sentencing. Allred summarized the charge as “driving Mr. bin Laden around Afghanistan”. Hamdan will have at least two appeals — one to the person appointed to oversee the tribunals, and one to a military appeals court — and possibly more at a later date. Pentagon spokesman Bryan Whitman told Reuters that the military plans to move forward with trials for 20 other suspected terrorists at Guantanamo, including five facing execution if convicted in connection with planning the September 11, 2001 terrorist attacks in New York City and Washington, D.C.. The United States has tried Hamdan before, once being appealed to the United States Supreme Court. In Hamdan v. Rumsfeld, a 2006 case before the court, the court found the previous tribunal system lacked “the power to proceed because its structures and procedures violate both the Uniform Code of Military Justice and the four Geneva Conventions signed in 1949″. Two cases were dropped before the current one was tried. 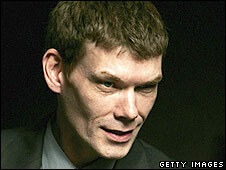 Beleaguered British computer hacker Gary McKinnon has vowed to fight U.S. extradition proceedings through the European Court of Human Rights. This follows on from yesterday’s rejection of an appeal to the the U.K’s Law Lords. American prosecutors who have pursued the case against McKinnon are offering a stark choice for the ex-systems analyst who allegedly broke into 97 US military and NASA computer systems. Some reports describe his UFO-related hacking efforts as, “the biggest military hack in history”; his lawyers have used alarmist language to describe the attitude of American prosecutors pursing him on six indictments, “American officials involved in this case have stated that they want to see him ‘fry’. The consequences he faces if extradited are both disproportionate and intolerable.” The plea-bargain offer on the table would see McKinnon face four years in jail if he accepts two of the charges. Estimates on how long a sentence he may face if he refuses this and is successfully prosecuted on all six charges go as high as 70 years. For the 1966 Glasgow-born man this is an effective life sentence.